Photo by Ryan McCaughtry. 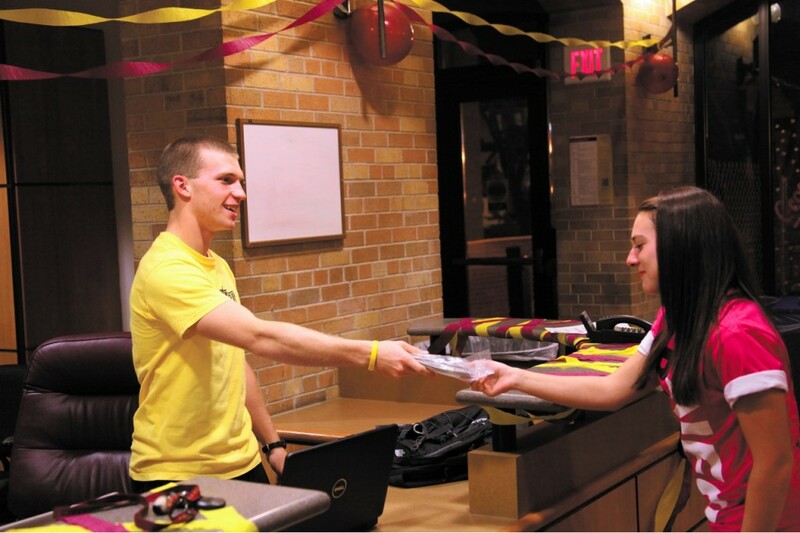 Levi Bachmeier (left) hands an Ethernet cable to Carly Grandner at the East Complex desk. Residence Life and ITS purchased cables for on campus residents to less the burden on the wireless connection. The college recently purchased Ethernet cables for students living on campus to improve Internet connection quality. According to Jasi O’Connor, director of residence life, between 200 and 300 Ethernet cables are now available for students to pick up at each residence hall desk. These cables are for students living in residence halls or campus apartments. Students living in campus apartments can go to the nearest residence hall with a desk to pick up cables. The cables will improve internet speed and reliability. The cables were purchased and delivered by the information technology department, but it was Residence Life who directed the process. The reason the cables were purchased was to enable students to use the new on-demand movie feature without the difficulties of streaming video over wifi. Wireless Internet is a radio signal, said Mitch Axness, manager of user support services in the ITS department. This means that a number of factors affect how well the internet works. Wall materials and thickness in buildings is one major issue on campus. Another is the number of people connected. According to Axness, the wireless internet connections have about 150mb bandwidth which is divided among however many people are connected. Another issue is that the wireless Internet is run by a controller. This controller only allows a limited number of connections. These issues lead to error messages and other issues when connecting to the wireless and issues with speed and reliability when using it. Jacob Erickson, a sophomore majoring in chemistry, recently picked up one of the Ethernet cables and says he plans to use it now that he has had multiple issues connecting to the wireless. “I’ve had a lot of problems with the internet over the last month or so,” Erickson said. Axness reported that ITS helps students with Internet issues several times a day, but that he thinks those numbers will decrease. David Sparer, a senior and the student manager at ITS, explained that using Ethernet cables will make it “more stable” to connect to the internet. According to O’Connor, if the gap between wired and wireless internet connection continues, the college will probably continue to provide Ethernet cables for future students. However, she said that the college is looking at upgrading the wireless connection but she didn’t know when that would happen. Axness said that a wireless upgrade is going to happen eventually, but the wired connection will always be faster and more reliable. It costs about $1700 to purchase the Ethernet cables for all the students. It would cost $100,000 to upgrade the wireless to wireless-n, a newer system that would improve overall connection quality. To just replace the controller, which would allow more connections, it would cost $10,000. Axness suggested that students should plug in devices that don’t move a lot like gaming consoles or Blu-ray players that use Wi-Fi. It would also help to use Ethernet when in the dorms to reduce the strain on the wireless connection. The new movie streaming system will also require that students connect to the wired internet while they use it. Students will be able to stream movies for free directly to their computers. The films offered are the same ones currently on Concordia’s movie channel but they will now be on-demand.